A handmade gift for mom! Here's a decoration for a door, to decorate and personalize in line with what the person who's receiving the gift likes: a really cute gift idea for a mom! The novelty of this door sign lies in the patchwork of different materials that compose it (mosaic tiles, paper napkin, felt, lace ribbon, scrapbooking buttons etc...).The trick is to choose the color scheme you want for the gift you're going to give (we picked pink and violet for our design), then to look, wherever you can find them, for a ribbon here, buttons there, a scrap of cloth or a paper napkin with a pretty pattern etc... all in colors matching the shades you've chosen. The first step, naturally enough, is to paint the door sign (whether it's in wood or cardboard), using acrylic paint. Then, as we're dealing with a door sign here, we need to write the person's name or the name of the room on it. We've decided to make the letters out of transparent, candy-colored mini-mosaic tiles (0.2 inch squares) : you just have to glue each square onto the sign using white glue. The lace ribbon is placed at the bottom of the sign with the help of fabric adhesive. The paper napkin's pattern is added using the paper napkin collage technique. 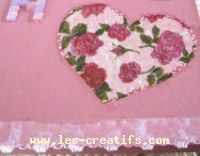 After everything has dried, the outline of the paper napkin Heart pattern is highlighted using a red multi-surface felt-tip pen in a 'zigzag stitch' style (with matching detail on the lace ribbon). A button is glued to the heart and a little felt is inserted into the holes of the button to make it seem as if the button is sewn onto the heart. Cut out two flower shapes in contrasting colors from the bits of felt. The flower is "mounted" onto the sign and glued on using the fabric adhesive. Finally, a button is placed in the center of the sign. Here we glue on differently-colored and shaped buttons here and there, as well as mini-mosaic tesserae (tiles) (at the top of the sign).